Rujak Cingur is a traditional food that can be easily found in the area of East Java, especially in its homeland, Surabaya. Rujak Cingur usually consists of several kinds of sliced fruits like cucumbers, krai (a kind of East Javanese cucumber), bengkoang, young mango, pineapple, kedondong and with addition of lontong, tofu, tempe, bendoyo, cingur and vegetables such as sprouts / bean sprouts , kale and beans. All the materials are mixed with a special sauce made from refined petis shrimp, boiled water, sugar/brown sugar, chili pepper, fried peanuts, fried onions, salt and thinly sliced green beans(bananas klutuk). All the sauces/spices mixed with uleg(pestle, I don’t think it’s the right translation though) way, that’s why rujak Cingur also often referred as rujak uleg. 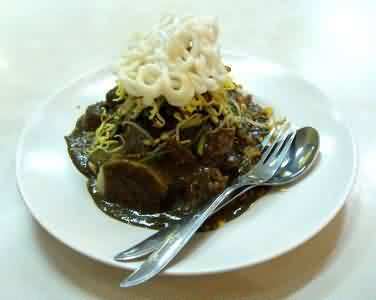 In its serving, Rujak Cingur is divided into two kinds, the ‘ordinary’ serving and ‘matengan’. The ordinary or generally, is of all the materials mentioned above as is. Whereas ‘matengan’ consists only of cooked materials only; lontong, fried tempe, bendoyo (a boiled krai) and vegetables(kale, beans, bean sprouts) that have been cooked. With no uncooked materials or the fruits, because basically there are people who do not like fruit. Both are using the same sauce. 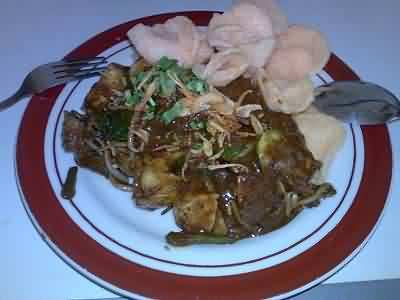 This food is called Rujak Cingur for processed ingredients used are petis shrimp and sliced Cingur (cow’s mouth.. I know, it’s hard to imagine). This is what distinguishes the food with Indonesia rujak in general, which are not using these Cingur materials. Rujak Cingur usually also served with white cracker on a pincuk (banana leaf) or a plate (I’d prefer the banana leaf).